‘Crissy’ (as she was known) was born at Port Pirie, South Australia on 26th July, 1904, the fourth child of Charles Jacob and Johanna Pauline Marie Zwar (nee Will). Older siblings Herbert, born 26.3.1898 (died 11.5.1899), Oscar, born 7.3.1900, Lucia, born 26.9.1902, then younger Harrold on 16.11.1908. Their mother (Marie) passed away on 16.3.1911, leaving father ‘Jack’ to care for four young children. After a succession of housekeepers, their father married the last, Emma Marie Louise Staehr on 30th April 1917. Her childhood was at the family farm and schooling was at Pirie Blocks State School, travelling by horse and buggy. She was in Port Pirie when the First World War ended, and people celebrated by rattling tin cans, which frightened the horse and it bolted. The family attended the Appila Lutheran Church, where she was confirmed. 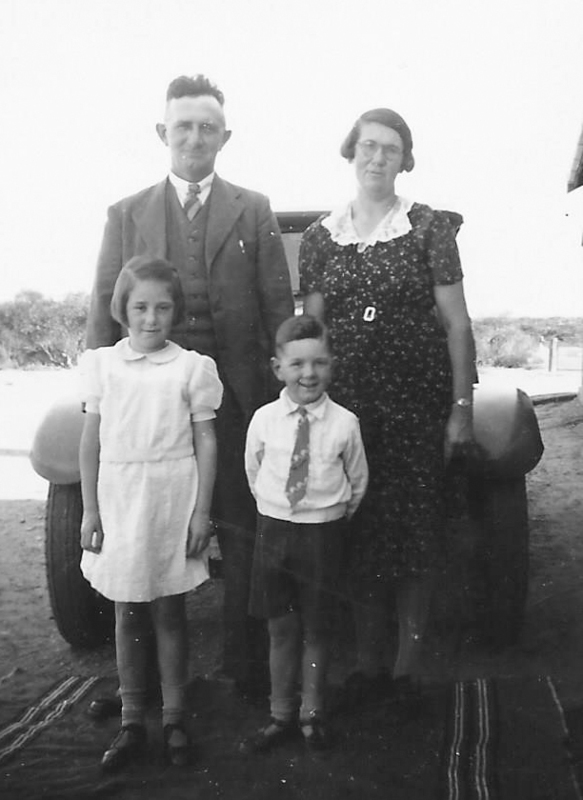 In 1928 the family moved to Mangalo, north of Cleve on Eyre Peninsula, where they share-farmed for her mothers brother, Fred Will. Crissy and Andrew moved to a farm north-west of Cleve, Section 5 Hundred of Campoona, which was their home for the rest of their lives. Carlene Marie was born on 20.2.1938 and Colin John on 1.2.1941, both in Cleve Hospital. For many years the family lived in 2 rooms enclosed in the end of the main shed. In 1962 they had a new house built slightly up the hill from the sheds, which gave a panoramic view across the farm. In March 1967 the shed dwelling burned down due to a kerosene refrigerator ‘blowing up’, and much memorabilia, photos, etc. were lost in the fire, as they were still being stored down there. Living 16 miles (25 Km) from Cleve, and with no school bus service, Crissy tutored the children using lessons and material by post from the Correspondence School in Adelaide, until Carlene was in Year 5 and Colin to Year 3. Colin remembers pestering his mother even before he was 5 years old, “When can I start school, Mum?” In 1947 the Cleve Area School was opened and Crissy dutifully drove the children the 4Km to the nearest school bus route each morning and collected them in the afternoon. Crissy hand milked sometimes in excess of 12 cows, then also separating the cream with a hand turned ‘separator’. With calves to be fed and gathering the eggs from their free range chickens. The cream and eggs were sent to Port Lincoln to supplement household income. The family were active members of nearby Yadnarie Lutheran Church, and Crissy held various offices in the Ladies Guild including Treasurer for many years. She was a good cook, and made many sausage rolls, cakes, etc. for suppers and afternoon teas. And the veritable feasts for Sunday School picnics. Biscuits and bread were baked, as were many bottles of jam, pickles, sauces and preserves. In the late 50’s and early 60’s she was also involved with the Kielpa CWA (Country Womens Association). To get an idea of how the family lived without the ‘mod-cons’ most of us take for granted, kerosene lamps provided lighting until an engine, generator and batteries were installed to provide 32 volt lights, just prior to their Silver Wedding Anniversary in 1956. Kerosene refrigerators were used until 1968 when 240 volt power extended past the property, and they were able to enjoy the convenience of electric appliances including refrigeration. The telephone only came in the late 1970’s. In 1974 Carlene and husband Dudley Thiele bought the farm, and a new transportable home unit was placed just up the hill from the main house for Crissy and Andrew. In her last 15 years Crissy had quite a few hospital stays, and in 1986 was hospitalised again this time with Multiple Myeloma and passed away in the Cowell District Hospital on 15th April 1987. By this time, Andrew was also a hospital resident, and he survived her by only 13 days. They are both buried in the cemetery of the now disused St. John’s Lutheran Church, Yadnarie. © Compiled by Alan Zwar from information supplied by her children Carlene and Colin.